One of the best ways to earn more points called SB is to invite your friends to sign up! 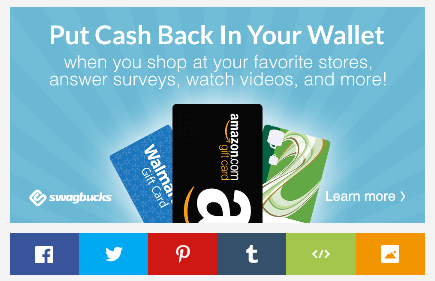 The easiest way to do this is the click on the “REFER & EARN” button at the top of the Swabucks.com page. Many times they Swagbucks will offer a bonus for getting a new referral and on top of that you generally earn 10% for life of what your referral earns! For example, if they earn 500 SB, you get 50 SB. You can send referrals in multiple different ways from the “Refer & Earn” page. 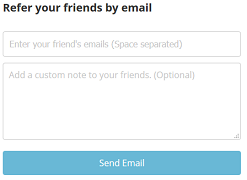 The first way to invite friends is via email, in which you enter their email address directly to a form, and then fill in the custom message box, if you want, and click “Send Email”. Adding a custom message is helpful, especially is they are not expecting an email about Swagbucks. At the bottom of the page, you can keep track of recent email referrals and if they have signed up or not. This is mostly helpful for people that you know and can easily remind them without it feeling like you are sending them spam. Below that should be a box with your referral link. To copy the link, either select with and press Crlt+c on your keyboard, or simply click the “Copy Link” button. Now you can post it anywhere! Your referral link can be a great thing to post in a signature or to share while chatting online with a friend. Though, remember to check a sites spam policy. Some sites or forums would consider posting your referral link “spam” and repeat offenders might have their account closed. (In general just be careful and you should be fine). To invite friends from facebook, twitter, & Tumbler simply click the proper button on the right. You might be asked to sign in or connect to your social media account. Once you do that you can add or change the message and post to your Facebook page or Twitter. You can also share various banners or images they have by clicking the “View all Banners” button. These can be shared to various social media pages, blog, or even directly downloaded. Remember, the best part about inviting is that when the person you invite wins while searching, you earn up to 10% of whatever SB they earn for life!